A report from the European Union Committee of the UK’s House of Lords said that Northern Ireland will be “profoundly affected by Brexit”. BREXIT HAS UNDERMINED political stability and exacerbated cross-community divisions in Northern Ireland, a new report has found. It said there would be a significant impact on many aspects of life in the country including on cross-border trade, the agri-food sector, energy, transport, fisheries, access to EU labour, healthcare provision, tourism, and police and security cooperation. 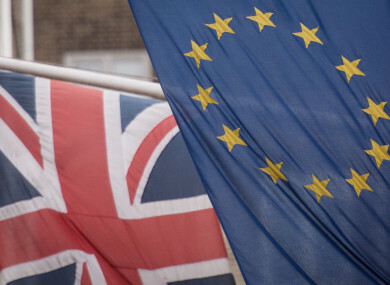 The report looks at the impact Brexit will have on the UK’s devolved governments of Scotland, Wales and Northern Ireland. It stated that political stability in Northern Ireland should not become the “collateral damage” of Brexit. The report stated that “new uncertainty” had been created by the collapse of the Northern Ireland Executive, the appointment of a new Taoiseach in Ireland, the DUP-Conservative arrangement and the fact that no Sinn Féin MPs had taken their seats in Westminster. According to the authors all this underlines “the fragility of the political settlement in Northern Ireland”. Northern Ireland has been a particular point of focus during negotiations between the UK and Europe over Brexit. Concerns have been raised in relation to the special relationship between Ireland and the UK and the existence of the common travel area between the two countries. Both Ireland and the UK don’t want a return to the “hard border” between the south and north of the island, however what will happen after Brexit remains an open issue. In its report, the House of Lords said the Good Friday Agreement had created a “delicate equilibrium” in the North. “It is imperative that Brexit does not weaken this equilibrium or the commitment and confidence of both unionist and nationalist communities in the political process,” it states. The committee members said they were “heartened” by commitments from all sides of the Brexit negotiations to protect peace in the North. The committee welcomed the European Council’s commitment to seek “flexible and imaginative solutions”. It called on the UK government to with with the EU to identify these solutions. In relation to other countries, the report expressed concern over a worsening on relations between Westminster and the Scottish government. Read: Are fisheries the first casualty in a Brexit split between Ireland and the UK? Email “Brexit has 'undermined political stability' and worsened divisions in Northern Ireland”. Feedback on “Brexit has 'undermined political stability' and worsened divisions in Northern Ireland”.